For the final game of the 2018 season, Liberty defeated Hardin Jefferson to improve to 7-1 record in district; the win was enough to secure a share in the DISTRICT CHAMPIONSHIP. Freshman pitcher, Kaci West, recorded 2 hits on the night while striking out 11. Liberty amassed 14 huts. Junior, Kara Cannon had an in the park HR, while Senior Harley Davis and Freshman Jaylen Prichard led the way with 3 hits each. Sophomores Baylee Chandler and Molly Barnette each had multiple hits along with Junior Jo McGinnis racking up RBIs. Liberty Defense had 0 errors. A Playoff SEEDING game will take place at Splendora High School Tuesday, April 24th at 6pm VS. Huffman. BI-DISTRICT playoff details are still to be determined, but most likely will be scheduled for Thursday or Friday of next week. District competition began for Liberty last night at Liberty High School versus the Lady Falcons from Huffman. Resulting score was Liberty 4 Huffman 1. Kaci West pitched 7 innings giving up 3 hits, walking 2 batters and striking out 9 and gave up 1 earned run. Players of the game were Kaci West (Pitching) and Bailey Webb who allowed 0 stolen bases. Liberty is now 1-0 in District and 14-10 Overall.We will travel to Cleveland on Friday for 430PM JV start and Varsity to follow. Thanks to all the fans who came out last night. We have been working hard and playing many softball games. This past weekend we hosted our 2nd Annual Southeast Texas Invitational. Thank you to all who came out and supported us in the beautiful weather! We have ONE more tournament to help us prepare for District competition but I wanted to update you on the games from our home tournament. Our overall record is 6-7 with losses to 6A: Bellaire, Woodlands, Ridge Point, Brazoswood. We will travel to San Marcos this weekend to face Central Texas large schools. Thanks again for all the support! We are working hard to keep our community and school proud of these hard-working young women! 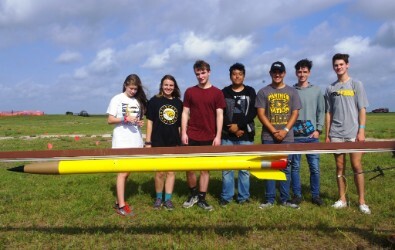 This past Saturday the Liberty High school Engineering Design and problem solving class and the Scientific Research and design class went to Smith point to test their rocket designs. The "Rocket Classes" have been working on the design and construction of these rockets since Christmas. They had to research materials and design a rocket to perform the assigned task. One group had to design a rocket that would carry a 1 pound payload to an altitude of 1 mile. Their "pencil rocket" flew very well producing one of the most stable flights of the day. It reached an altitude of 3186 ft coming up short of the 5280 ft they have designed for. They will evaluate the results and produce a post flight analysis explaining what happened and why. 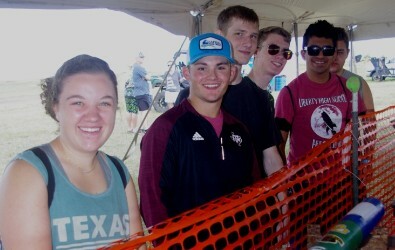 The second year group was tasked with designing a rocket that would break the speed of sound. This sound easy but puts much more stress on the rocket and can cause the rocket to behave in unexpected ways. When their rocket left the launch pad it accelerated to the speed of sound very quickly where it became unstable and tumbled. So their data says they broke the speed of sound for a moment but that was it. As their rocket drifted down to the ground under its parachute you could almost hear their mental wheels turning. What happened? Why did it do that? 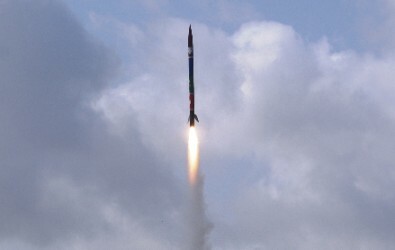 At the end of the day they had determined that they did build a stable rocket but as it approached the speed of sound the sonic shock wave produced had pushed against the nose cone causing it to become unstable.Throughout the process the students had to deal with more than a few setbacks which they overcame to reach the launch. We are all very proud of them and congratulate them for joining a select group of college bound students. Most of these former students have gone on to graduate with degrees in science and engineering and we can expect these to do even better. Last year the Panther soccer team was blessed to have several young men named to the All-State team and this year the trend continues. Sophomore Hector Del Rio was named to the Honorable Mention All-State team. Senior Eduardo Diaz was selected 1st Team All-Region and Junior Jesus Landaverde was selected 2nd Team All-Region. Freshman Jonathan Juarez was named to the Honorable Mention All-Region team. This is a very big honor for these young men, our school and our community. Please congratulate these boys when you see them and thank you again for your continued support of Panther soccer. Go Panthers!! On Thursday I had the great opportunity to wear two hats and lead two groups in playoff battles. The Panther Players traveled to Barbers Hill for Area One Act Play competition in the morning and early afternoon. Although the Panther Players did not ultimately advance to Region, three Panthers were named to the All-Area Cast and Crew. Daisy Zboral was named again to the All-Star Tech Crew, while Sydney Underwood was named Honorable Mention All-Star Cast with Avery Benedele being named to the All-Star Cast. The ENTIRE cast and crew put on an amazing show run and look forward to next year's competition. Later in the day, the Panther Soccer team traveled to Madisonville and became the Bi-District Champions with a 2-1 victory over Gatesville. Eric Espinosa curled the back post for a 28th minute free kick score and Giovanni Lopez scored from a corner kick in the 39th minute to hit the break with a 2-0 lead. The second half was a tense affair down to the wire, with the Panthers ultimately winning. The Panthers will face the Center Roughriders in Hudson on Tuesday at 8 pm in the Area Championship game. Liberty will be the home squad and tickets for the game will $5 for adults and $3 for students. Thank you to everyone for the continued support. Go Panthers!! The LHS Panther Players traveled to Huffman to compete in the District 23-4A One-Act-Play competition. I'm happy to report that Liberty earned one of the advancing spots with their performance of Michele Palermo's Ladies in Waiting. Sydney Underwood was named to the All-Star Cast, while Avery Bendele and Reagan Mayo were named to the Honorable Mention All-Star Cast. Daisy Zboral was named to the All-Star Tech Crew. Aliyah Banda, Nolan Myers, Hope Wilson, Destiny Collins, Alyson Smith and Laurel Litton are also part of the advancing cast and crew. The Panther Players will now travel to Atascocita High School on Thursday March 22 for Bi-District competition. Liberty will perform at approximately 4:40 pm. Tickets will be $8 at the door. The address is 13300 Will Clayton Pkwy, Humble 77346. The Panther Players will do a public performance of the show on Wednesday March 21 at the LISD Auditorium in preparation for Bi-District. Tickets will be $5 at the door. Go Panthers!! Last night at the LHS Black Box Theater, the Panther Players presented Wanted: One Groom, a one act play directed by LHS Junior Morgan Galvan. Ms. Galvan is the seventh Panther Player to student-direct a show this season. Her cast included 9th grader Maritza Miranda, 10th grader Ashley Roberts, 9th grader Wyatt Tulley, 10th grader Jakeb Madden and 12th grader Kelbie Strawn. Lights, hair, and makeup were taken care of by 10th grader Laurel Litton and 12th grader Destiny Collins. The play was well received and attended. The students had a good time getting ready and were excited about the opportunity to perform. The included cast picture is from left to right:Morgan Galvan (seated), Maritza Miranda (standing), Jakeb Madden (seated), Wyatt Tulley (standing), Ashley Roberts, Kelbie Strawn.Thanks again to all that attended and continue to support the fine arts of Liberty I.S.D. Go Panthers!! Last night the Lady Panthers flexed their scoring muscle and defeated Anahuac 10-2. Freshmen Tori Parsons and Kennedy Evans both recorded hat tricks (3 goals in a match), while Freshman Olivia Moore and Junior Jessica Hernandez both contributed a brace (2 goals in a match). The Lady Panthers rang the scoring bell in the 2nd minute when Parsons found Moore. Moore then found Evans in the 6th minute. Freshman Lali Garcia was able to pick out Evans for her second score in the 12th. Another scoring flurry occurred at the 30th, 32nd and 33rd minute marks as Parsons, Evans and Moore would all find each other for trade off goals. Hernandez and Evans would switch with each for the next two goals after the break in the 48th and 59th minutes, while Indira Samano and Moore would find Hernandez and Parsons in the 61st and 73rd minutes to complete the 10 goal game. The Lady Panthers made program history when they recorded the most district goals in a half (6), the most goals in a district match (10) and the largest margin of victory in a district match (8). The Lady Panthers are coached by Jonathan Lopez. The Lady Panthers face the Lady Hawks of Hardin-Jefferson at 5 pm on Friday in Sour Lake. Go Lady Panthers!! Last night the Panthers hosted Anahuac in 18-4A District action and ended the match with a 6-0 victory. Eduardo Diaz started the scoring flurry with a 9th minute goal off a Hector Del Rio pass. One minute later, Jonathan Juarez would find the back of the net via a Giovanni Lopez assist. In the 13th minute Juarez would find Hector Del Rio for a score. Del Rio and Juarez switched roles and paid each other back in the 32nd minute on a tap in goal. Xavier Montez curled in a goal from the right side beating the keeper high to finish the first half barrage and send the game into the break 5-0. Victor Lopez finalized the game 6-0 with his 74th minute goal, with the assist from Jaime Lopez. Jaime Lopez and Jesus Landaverde combined for the shutout. The Panthers travel to Sour Lake on Friday to square off against the Hardin-Jefferson Hawks with sole possession of first place on the line. The match will be at 7 pm. The Lady Panthers will start at 5 pm. Go Panthers! !PS Shout out to the Lady Panthers for their HUGE 10-2 victory last night. On Friday night the Panthers hosted the Hudson Hornets in a rematch of last year's Area Playoff game. This time though, the Panthers came out on top. The 2-0 victory was secured with very strong defensive play, lead by freshman goal keeper Jaime Lopez, who got credit for the shut out. A 0-0 halftime score was broken early in the second half when junior forward Daniel Villegas scored on a throw-in from sophomore Hector Del Rio. Senior Xavier Montez would add his two cents late in the game to complete the scoring. The JV Panthers started the evening with their own 5-1 victory over Hudson. Jaime Lopez would record a hat trick to go along with goals from Edgar Reyes and Sabastian Urbina. The Panthers will be hosting the annual Alumni Match on Friday evening February 9th at 7 pm. Come out to Memorial Stadium and support Panthers, both new and old. Go Panthers!! Last night the Panthers traveled to Silsbee to face off against the Tigers. The JV opened the evening with a well played 3-2 victory. Sabastian Urbina lead the charge for the Panthers with a brace (two goals) and freshman Tomas Gonzalez sealed the victory with his score late in the second half.The varsity Panthers completed the evening by securing a 2-2 draw. The Panther and Tigers played a hard fought 0-0 first half. The Tigers would score in the opening minutes of the second half. Scores from Victor Lopez and Hector Del Rio would ultimately seal the draw on the evening. The Panthers are next in action Friday night, hosting the Diboll Lumberjacks at 7 pm. The Lady Panthers will begin the action with a 5 pm match against Bob Hope. Go Panthers!! This past weekend the Panthers participated in the 5th annual Liberty JV soccer tournament and posted a second place finish. The Panthers won both of their Thursday games, beating Goose Creek Memorial 2-0 and Crosby 2-1. They fought the good fight on Saturday, but ultimately fell to Beaumont Central. On Friday the Panthers traveled to Dayton to face the Broncos. It was a very tense match for the entire 80 minutes. The Panthers surrendered a goal in each half in the 2-0 loss. On Tuesday, the Panthers travel to Silsbee for 5 pm and 7 pm matches. (fingers crossed) If all goes well and the weather cooperates, the Panthers will finally have a home match Friday versus Diboll. As always, Go Panthers!! It's that time of year again...SOCCER. The Panthers started the new year with an annual trip to Port Neches for the PNG tournament. On Thursday, the Panthers faced off against the host PNG Indians and played a thrilling first half that stayed close. Some late second half goals pushed the score in the favor of PNG. The Panthers would rebound on Friday with two wins against Little Cyprus-Mauriceville and Bridge City. Freshman goal keeper Jaime Lopez recorded his first career shut out against the LCM Bears, while his brother, junior midfielder Giovanni Lopez, would score the go-ahead goal in the 54th minute from a Victor Lopez free kick. 1-0 would be the final against the Bears. Later in the day, the Panthers bested the Bridge City Cardinals 2-1. Junior midfielder Jesus Landaverde buried an 11th minute penalty kick and senior forward Xavier Montez would secure what would be the winning goal shortly before halftime in the 39th minute. The Panthers travel to Livingston on Tuesday January 9th to face the Lions, with start times at 5 pm (JV) and 7 pm (V). Go Panthers!! On Saturday morning the Panthers faced off against 6A Beaumont Westbrook. Normally, I do not give too much press to the sub-varsity squads, however, what happened Saturday was not normal. In what seemed like something straight off the pages of a movie script, the Panthers overcame some very long odds indeed. Because of illness, injury and work, the Panthers were left with only 7 available players (the minimum required to start an official match) to get on the bus. Those 7 Panthers faced off against an 11 man side, with another 15 waiting on the bench, for an ENTIRE match and went toe to toe, securing a 1-1 draw. Giovanni Ruiz leveled the score early in the second half with a 15 yard power shot that found the upper right corner. Watching the game unfold from the sidelines and seeing and hearing the boys talk to each other, move in harmony with each other and most importantly, believe in one another, made every single early morning practice, every long bus ride, and every heart ache that I've experienced in coaching worth it. In a sub varsity match that most people, aside from family, will never care about, 7 boys found their moment and exposed the very best of what they're made of. Later on in life when the storm clouds circle them while Goliath taunts them and they are tempted to give up thinking all is lost, it is my prayer that they will remember this day when they looked into their hands and found a sling and some stones and realized that no situation was too big for them. Edgar Reyes, David Gerardo, Jonathan Ruiz, Eric Jimenez, Miguel Galvan, Giovanni Ruiz and Jesus Landaverde have henceforth been dubbed the New Magnificent Seven. It is with great pride that we announce LHS paraprofessional Dustin Vollert has been chosen by you as our PCAT Bus Driver of the Year for 2017-2018. Dustin's work ethic, integrity, student management know how, and driving skills made him a great candidate for this award. As you know, Dustin was chosen earlier this year as the LHS Paraprofessional of the Year 2017-2018, another testament to the character he brings to the job. There were many other deserving bus drivers nominated by you as well: Laura Arceneaux, Jim Elsberg, Joyce Gates, Tina Greene, Diana Harmon, Vicky Huckabay, Bertha Lopez, Thyra Nance, Felecia Osen, Elizabeth Smith, Patricia Warming, and Todd Warming. These drivers deserve recognition, congratulations, and a thank you as well. Liberty High School students traveled to Huntsville on Saturday to compete in the UIL Regional Academic Meet. Liberty's Literary Criticism team won first place in Regional Competition. Individually, TaNia Donatto took first place, Keaton Parker, second place; Emily Connelly, third place; and Wyatt Tulley, a freshman, took fifth place. Gavin Deshotel, not pictured, is also a member of the Literary Criticism team. Keaton Parker competed in Headline Writing, where he took second place. All of these students will advance to the state meet to be held in Austin next month. This will mark the Literary Criticism team's 14th consecutive appearance at the state meet. Other teams competing at the Regional Meet were Liberty's Spelling Team, Social Studies team, and Computer Science team. Congratulations to all students competing in Regional Competition. 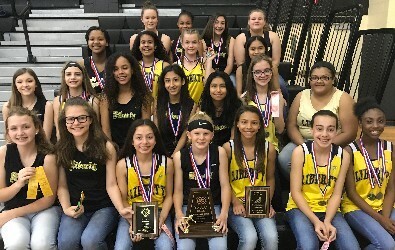 Your 7th grade Liberty Lady Panthers are the 2018 District Champs!!!! Last night, your Lady Panthers made a statement to everyone, that they were in it to win it. Going into the night, we knew that they had a chance and were more than capable to take home the title. "Go for Gold" and "Leave it all on the Field", were the night's mottos. Each athlete contributed something to their team last night. These ladies deserve all of the praise. They represented their District well. If you see any of these young athletes, please congratulate them!! We are looking forward to watching this group grow and compete throughout their years in our MS and HS programs. The Liberty FFA Breeding Heifer Show Team traveled to San Antonio, Texas for the San Antonio Livestock Exposition (SALE). The showman did an excellent job exhibiting their animals competing against the best in the state. The Simmental-Simbrah Superbowl is held in conjunction with the SALE, This show is made possible by breeder sponsors who each put up $1,000 and junior exhibitors who purchase calves from those breeders are eligible to compete. Kaitlin McIntosh exhibited her Junior Simbrah Mimi Pebbles placing 2nd in class earning $100.00. Chastie Evans exhibited Calamity Jane her Senior Simbrah heifer placing 5th in class earning $70.00 and Gracie Evans placed 6th in her respective class earning $60.00. The girls were awarded a total of $230.00. Thursday was a busy day eight head of cattle were exhibited we started off with the Simbrah show Kaitlin McIntosh placed 4th in class, Gracie Evans placed 9th in class and Chasitie Evans placed 7th in class. Kyle Ming exhibited a second place Limousin. Carter Haidusek exhibiting his Brahman placed 6th in class. Brangus cattle were exhibited by Caiden Pickett placing 4th in class seven and Mattie Beasley placed 3rd in class thirteen. Hayden Chapman exhibited his ORB Charolais Cross placing 3rd in class with his cow calf pair. Melanie Evans rounded out the day exhibiting her ARB placing 2nd in class. Friday morning Laura Moorman exhibited her Angus heifer placing 9th in class. Madalyn Pickett closed the day with astonishing success! Madalyn placed first in class 15 with Lola and Rowdy her cow/calf pair. She earned the honors of Senior Division Champion, followed by GRAND CHAMPION CHIANINA! Madalyn was presented with a Grand Champion Buckle and a $10,000.00 Scholarship from the San Antonio Livestock Show. We are proud of the hard work and dedication these kids put into raising these outstanding animals and exhibiting them at the State Level. The students are preparing to exhibit this same group of Livestock at the Houston Livestock Show, March 8th-11th, 2018. The LHS Panther Players competed at the Bi-District One Act Play contest. The Panther Players had a very successful night and secured a place at the AREA competition to be held this coming Thursday March 29 in Mont Belvieu at Barbers Hill High School, 9696 Eagle Drive, Mont Belvieu 77580. The Panther Players will be performing at 12 noon. Tickets for the show will be $10 dollars at the door. Five Panthers took home individual awards last night. Stage Manager, Daisy Zboral, was named to the All-Star Technical Crew. Aliyah Banda made the Honorable Mention All-Star Cast, while Reagan Mayo, Avery Bendele and Sydney Underwood made the All-Star Cast. A special thank you to the many that continue to make this experience so great, especially Mrs. Benecia Bendele who continues to make sure we don't starve and Mr. Gus Figeac, my right hand that takes care of the MANY small details. Go Panthers!! On Saturday, the LMS Panther Players traveled to Tarkington Middle School to compete in the District 23-4A MS One Act Play competition. The LMS Panther Players took home a 3rd place finish with their performance of The Kentucky Marriage Proposal. Three Panthers took home individual honors. 6th grader, Emerson Rawlinson was named Outstanding Tech Crew member. 8th grader, Sage Drinkard was named to the All-Star Cast list and 8th grader, Tucker Schilling was named 23-4A Best Male Actor. Go Panthers and enjoy the video!! This year has been so much fun! All of the Fine Arts programs are doing wonderful and amazing things. My Theater Arts classes are attempting to document as much as possible in a way that will allow me to teach them how to use video, audio, lighting and staging and then take those items and edit them in a meaningful way. I want to say thank you to Christie Bean and her choir students for providing a palette for my kids to begin learning how to visually paint. Coming soon are projects involving Mr. Bob Smith and his Jazz Band, as well as, Mr. Terry Higginbotham and his blossoming Law Enforcement program. Merry Christmas and enjoy the LHS Choir Video. Go Panthers!! The LMS A teams made quite a statement this weekend at the Tarkington Middle School Volleyball Tournament The 7th grade went 3-1 on Saturday and brought home 3rd place trophy, while the 8th grade went 2-1 and clinched 2nd! The 7th grade A team started the day out early, with an 8:00 game against a very talented Bridge City team. Our girls battled, but missed serves and defensive errors got the best of the Panthers and they fell short 25-15 and 25-21. The girls would now have to work their way up the bracket in order to bring home the 3rd place plaque. Keifer Crossing, a New Caney Middle School, was the next opponent the girls would face. The Panthers came out strong and with the help of Reese Evans and her 19 total points off of serves, the Ladies blew past Keifer Crossing with scores of 25-14 and 25-7. The third game the Lady Panthers played, was against Moorehead, a middle school out of Conroe. Knowing that a win over Conroe would put the girls in place to play for the 3rd place plaque, the ladies came together and played very aggressive volleyball. The serving game was again, strong for the Lady Panthers with, Reese Evans and Morgan Vaughn, standing out at the service line with 24 total points for the Panthers. The Panthers beat Moorehead with scores of 25-15 and 25-12 and would immediately play Diboll for 3rd place. An exciting and tough matchup for the Lady Panthers, the girls left everything on the court and came out on top in two, clinching the third place title, with the scores of 25-23 and 26-24. The 8th grade A team faced Moorehead, in their first match of the day. It was a tough battle of 3 games, but the Panthers overcame the opponent with the scores of 20-25, 17-25 and 15-8. The next game would be against Keifer Crossing, who they would beat 25-11 and 25-22. Coach McAdams was very impressed with her team and said it was the best the team had played all season. They worked together and communicated well. Emalee Villarreal, was outstanding on defense while, Adrienne Trahan, was outstanding on offense. Last night, the lady panther volleyball teams traveled to Hardin Jefferson to take on the lady Hawks. 7B kicked it off with a victory in a close matchup, with the winning scores of 25-23, 25-22. The team's lead servers were Sadie Cary and Autumn Bennett, with a combined total of 7 points in serves. These girls are now 3-1 in district play. 8B battled in another tight match, but overcame the Hawks in the first set with a score of 25-23. The Panthers were able to pull away in the second match with the help of Isaballe Cannaday and Celeste Grana Espinoza who both put on impressive defensive performances. Katelynn Singh was the team's top server, scoring the team 11 points off of serves, including 2 Aces. The lady panthers won the second game 25-16. These ladies are now 3-1 in district play. 7A was next to play and put on quite a show. The Lady Panthers found themselves down early to the Hawks with a score of 14-4. It was Morgan Vaughn who was able to serve her team back into the game. Morgan served 12 points in a row which gave the Panthers a 16-14 lead. The Lady panthers came together and defeated the Hawks in two games, 25-22 and 25-11, with the help of Reese Evans and her outstanding defense. These ladies played the best they have all season and are now 3-1 in district play. 8A finished the night with a tough matchup against a talented Hawk's team. The ladies came out strong and were ahead of the Hawk's 20-14, but fell short 25-23. The ladies turned it around in the second game, with the help of Kirsten Moss, who served her team 10 points in a row, and won the game 25-21. In the third set, missed serves got the best of the Lady Panthers and they were unable to come away with the win. The Lady Panthers will travel to Tarkington this weekend to play in their final tournament of the season. The next district game will be Monday, October 16th against District rivals, Huffman Falcons. The game will be played in Huffman. Please come out and support these girls, as all 4 teams fell short against Huffman in the last matchup. It will be a great game! This win would put the team into the Championship game against District rivals, the Tarkington Longhorns. The first match of the game was a close one, but Liberty would come up short with a 25-17 loss. The second match did not go as planned. Miscommunication and defensive errors would keep the girls from clinching the 1st place title. The girls finished 2nd place in a very competitive tournament. Overall, LMS had a very successful weekend of volleyball. Congratulations to all of these ladies. The Lady Panthers will play the Huffman Falcons on Monday October 16th, in Huffman. Please come out and support these ladies in what is expected to be a very good game! This past Saturday, the 7th grade A team traveled to Barbers Hill for their first tournament of the season.The 7th grade came out strong early and defeated the Dayton Broncos in 2 games with the scores of 25-23 and 25-10. The girls fought hard in game two, but fell short to Barbers Hill South. The lady panthers would then play the Crosby Cougars for 3rd place. These young ladies came together and put on an outstanding performance and swept the Lady Cougars in two. All of these ladies worked hard and continue to show improvement each day. Please congratulate them when you see them! Our next game will be Monday, September 25th, against the Cleveland Indians in Cleveland. Please come out and support these young lady panthers. Good morning Panther Nation!! Earlier today, the Panthers traveled to Anahuac for a cross country invitational meet. Both boys and girls teams greatly improved from last week's opening race, with each runner besting their previous Saturday run time by at least one minute. Carlos Becerra paced the boys team with a top 20 finish, while Yasmine Valencia was the top finisher for the Lady Panthers. 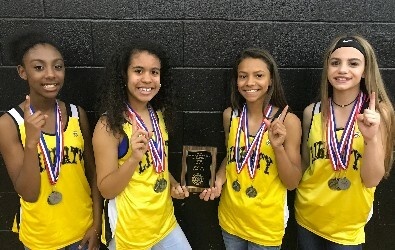 Miriam Valencia led the LMS Lady Panther team consisting of Julia Gerardo, Mariah Lopez and Lexi Smart. Alberto Diaz represented the LMS Panther Boys with a strong showing as well. Next Saturday the Panthers will be hosting the annual Tony Munson Invitational at the Liberty City Park. Be sure and come out to support the Panthers. The first race will start at 8 am. Go Panthers!! This morning the Liberty Panther and Lady Panther cross country teams traveled across the river to run in the Dayton Bronco Invitational. Due to the effects of Hurricane Harvey, this was the first competitive run for the cross country team. With not much time to shake off the rust, the kids still competed well and were able to get good base line times as they work to improve and be ready for district in October. The Panther teams will travel down to Anahuac next Saturday. Go Panthers!! Liberty First Responders were thanked by SJE students on Tuesday September 12th. Students made cards, posters and books. Chris Watson gathered members of the Liberty PD and Fire Department.